PHOENIX – They’re calling them “walk-ins,” as Arizona teachers across the state protest today to demand higher pay. About 1,000 public schools are expected to participate. Teachers, along with staff, parents and community members, have said they’ll march arm-in-arm into schools before the start of the day as a show of solidarity. Their demands include 20 percent raises, smaller class sizes and no new tax cuts until Arizona’s per-student spending reaches the national average. Gov, Doug Ducey has said a 20 percent raise, which would cost more than $600 million, is out of the question. Teachers got a 1 percent raise last year and Ducey’s proposed budget allows for another 1 percent this year. He has vowed not to raise taxes or reverse any corporate tax breaks that he’s created since taking office. The National Education Association ranks Arizona among the lowest states for teacher salaries and per-pupil spending. Karvelis said he chose his career because he’s passionate about education, but as a second-year teacher, he makes about $34,000 a year. He said he recently gave up his apartment because he was struggling to pay rent. Karvelis’ group, Arizona Educators United, formed just a few weeks ago, drawing inspiration from teachers who staged a successful labor strike in West Virginia. Arizona teachers have said they hope they can reach a deal with the state without a strike. 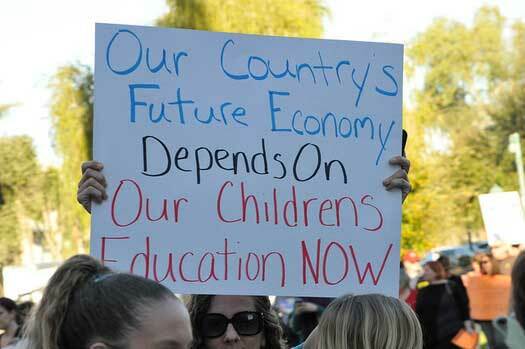 The group’s list of demands is online at arizonaeducatorsunited.com/demands.